If "Star Wars: Episode II - Attack of the Clones" is about to open in theaters, it must be time for "Star Wars: Attack of the Toys" to begin invading stores. That's just what happened Tuesday, when merchandise tied to the movie materialized at Toys R Us and elsewhere. Only this time the rollout was more subdued, after some of the esoteric fare released for 1999's "The Phantom Menace" languished on shelves for months. "We've scaled it back a lot," said Lucasfilm licensing executive Howard Roffman. "We're going to stick to the basics - toys, video games ... the things our fans prefer, rather than some of the fringe items." Thus you won't see Queen Amidala's face on your Pepsi can this time around or be able to relax in an Anakin Skywalker inflatable chair. You won't have any Obi-Wan Kenobi clip-on braids to attach to your hair. Merchandising executives at Lucasfilm Ltd. cut the number of products connected to "Attack of the Clones," which opens May 16, to fewer than 50 after releasing about 85 for "Phantom Menace." "Last time, they just shipped too much," said Dave Gerardi, senior editor of the toy trade magazine Playthings. "After a few months, retailers had to put a deep discount on them and still couldn't move them." A lot of the surplus toys - many of which featured the much-maligned Jar Jar Binks character - hung in store aisles so long they earned the dubious title of "peg warmers." 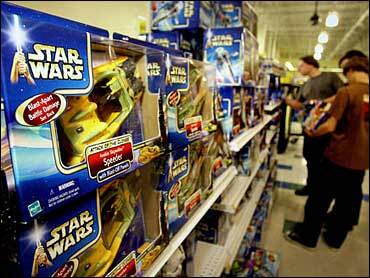 The "Star Wars" merchandise line was still wildly successful, earning about $2 billion worldwide. The third "Star Wars" film, "Return of the Jedi," had come out 16 years before "The Phantom Menace," and Lucasfilm and toy manufacturer Hasbro Inc. acknowledged overestimating the market. "When you have a large breadth of characters and products like that, you're not going to hit on every single one," Hasbro marketing executive Martin Pidel said. About 20 different "Attack of the Clones" action figures, priced at about $6, were released Tuesday, with the number increasing to about 50 by year's end. At a Toys R Us in Los Angeles, about 100 fans were lined up by midnight to grab their "Star Wars" products first thing Tuesday. Carla DellaGatta, 26, was a little alarmed to be one of the few people in costume for the event - especially since it was 57 degrees and she was wearing a custom-made Princess Leia "slave girl" bikini from "Return of the Jedi." Luckily, she had a black topcoat. Ivan Munguia, 30, was first in line, waiting with his mother-in-law, brother-in-law, mother and wife - who was sleeping in the car. "Last time, the store limited buyers to two of each action figure, so I had to bring a lot of people," Munguia said. Highlights of the new toy line include bounty hunter Jango Fett and his horn-shaped spacecraft Slave I, and Jedi warriors Obi-Wan Kenobi and Anakin Skywalker, molded with magnets in their hands so they can use "the Force" to draw weapons into their grasps. For about $100, there's an 18-inch R2-D2 droid that is moved around by voice command. "You can even say, 'Hey, Artoo, it's Darth Vader and he'll get real scared, his electric eye will glow red, and he'll back up and squeal," Pidel said. Meanwhile, "Attack of the Clones" promotions through Frito-Lay chips and General Mills cereal are expected to be low-key compared to 1999, when about 8 billion "Phantom Menace" Pepsi cans were produced and Pizza Hut and Taco Bell "Star Wars" commercials were ubiquitous on television. There are no soft drink or fast-food deals this time. "Last time, we really went for promotional tonnage," Roffman said. "But I think that just contributed to the sense that you couldn't turn around without seeing 'Star Wars' in your face."